This book wasn’t on my list to review, but how could I turn away the Teenage Mutant Ninja Turtles? Being a fan since my childhood, I had to pick up this one-shot, part of IDW’s 20/20 project. In celebrating their 20th anniversary, they are taking a number of their best selling titles and either thrusting them 20 years in the past or 20 years in the future. With this issue, we go 20 years in the future, to a war-torn Earth and a different dynamic for the heroes in a half shell. From Paul Allor and Nelson Daniel, the story centers around Krang and the Utrom Civil War, as war rages across the globe. 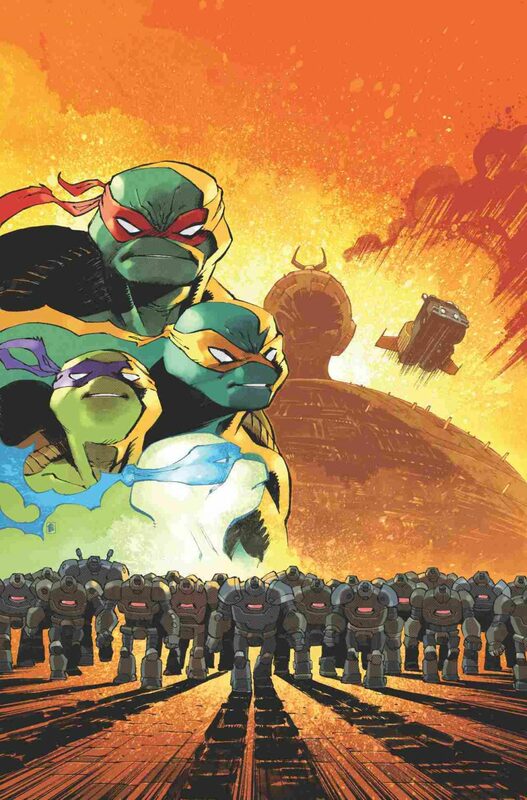 A group of Freedom Fighters are trying their best, and the Turtles set out to destroy a backup of the Technodrome, all while trying to save Donatello in the process. It’s a different world, with a different leader for the turtles, but it makes sense why. The turtles still feel like themselves in the future, though the zaniness is toned down a bit. The book looks, feels and reads amazingly. I got a kick out of a story set so far in the future, and with a twist ending that will leave you wishing this wasn’t a one shot. The future has taken its toll on the turtles, but heroes never quit. It has been a great 20 years for IDW, and I can’t wait to see what is next in their 20/20 project. I give this far-flung future tale an 8 out of 10.